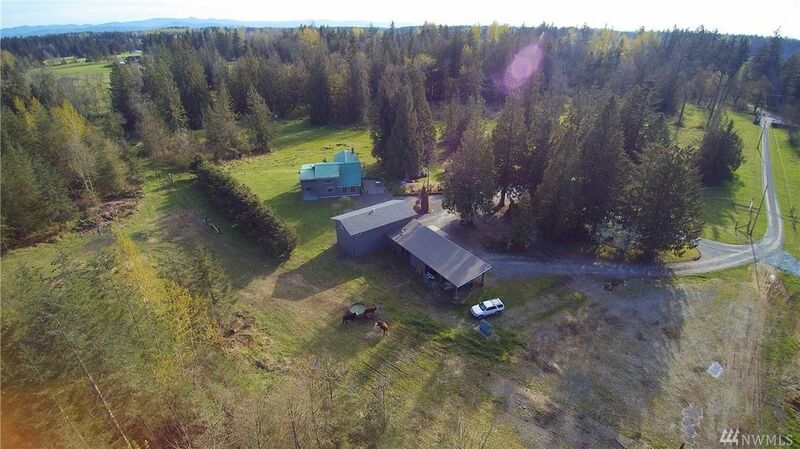 The country life you’ve always dreamed of is waiting in Eatonville! 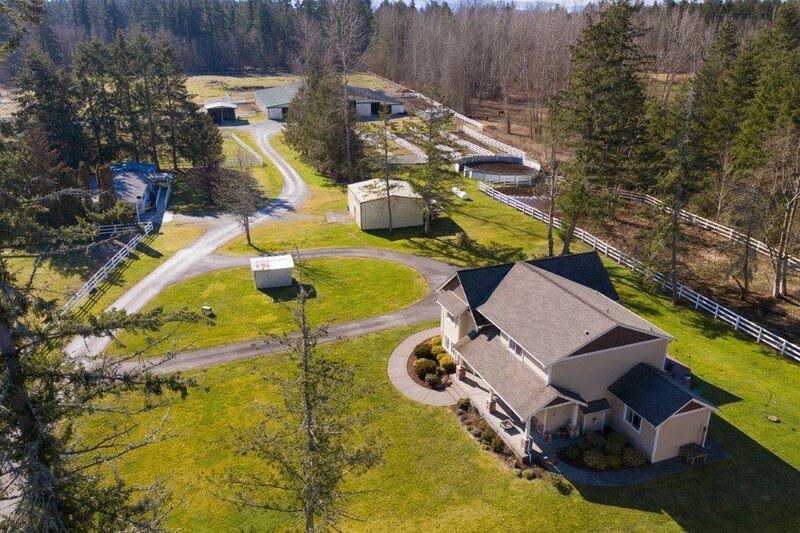 This expansive 7.16-acre property features a fabulous 3,080-square-foot daylight rambler, an ADU, a 4-stall barn with storage, a detached garage, and plenty of land for you to explore! Whether you desire a hobby farm, an equestrian property, or just some space to really spread out on, this dynamic paradise offers adventure and opportunity for it all. 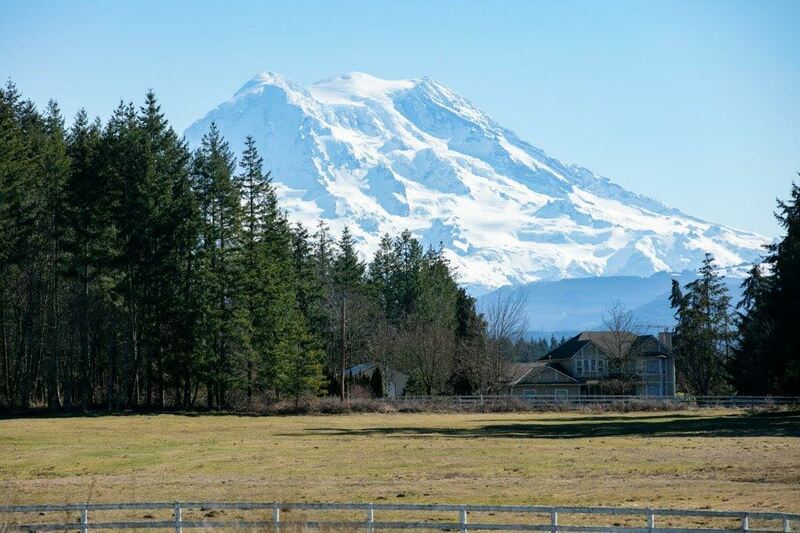 Located at 31615 44th Ave E Eatonville, WA 98328 in the shadow of majestic Mount Rainier, this residence is listed for $499,950. 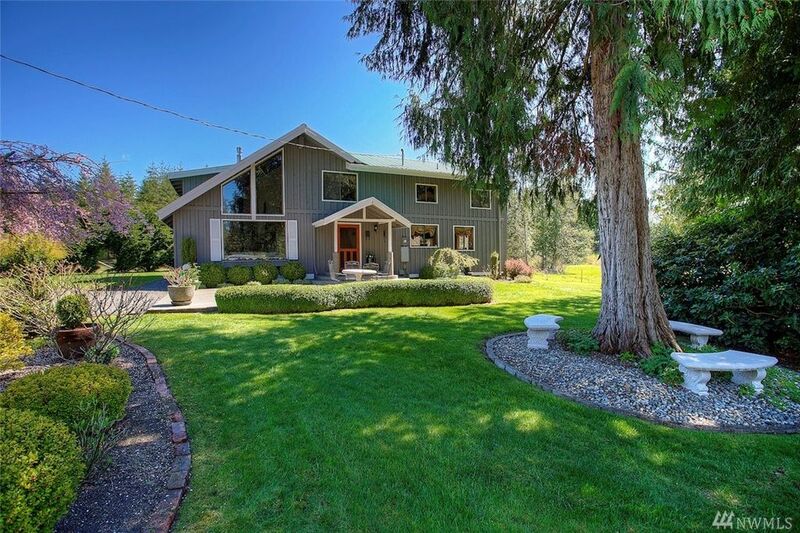 Nestled in a lush haven replete with the beauty of the Pacific Northwest, this storybook setting offers a secluded atmosphere that allows you to get away from it all. Find green pastures where animals can graze, go fishing in the stocked pond, or just enjoy the view of it all from the huge backyard deck that’s perfect for entertaining on! 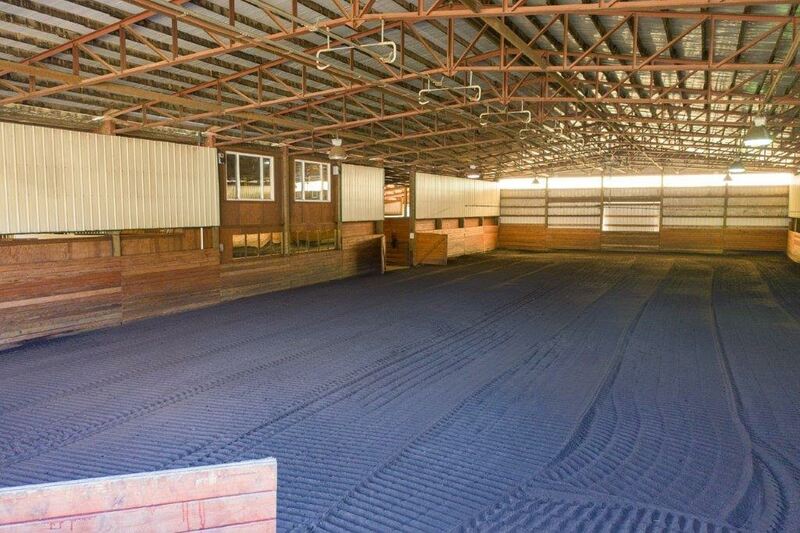 Whether you choose to raise livestock, have a farm (currently in Pierce County Farm & Agri designation), or just need some storage for your outdoor toys, this home also features a 4-stall barn, equipment/feed storage, kennels, a run-in shed, and a detached garage. Tucked away in this country oasis is the inviting 3-bedroom, 2.5-bath residence, a palatial wonder boasting cabin-inspired accents and elegant style. 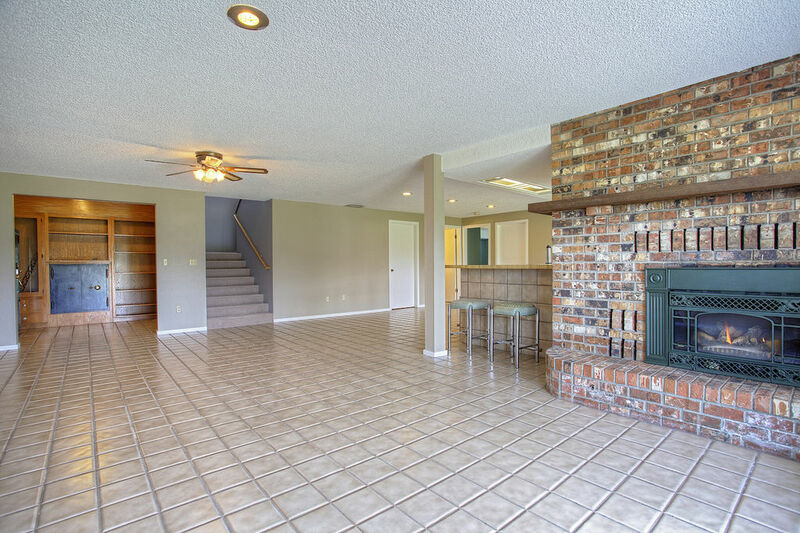 In the great room, find vaulted ceilings with exquisite exposed beam accents, and a gorgeous brick-accented fireplace in the center of it all. Floor-to-ceiling windows fill the space with cheerful natural light, all while offering a view of the beautiful grounds beyond. The bright and spacious living room flows right into a versatile dining area, offering you the opportunity to decorate this space to your heart’s desire! 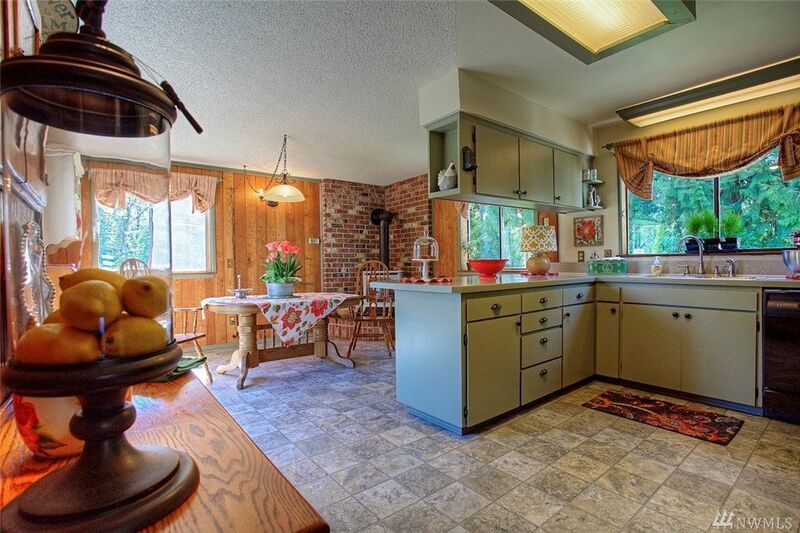 The adjacent kitchen also features a huge layout to take advantage of. Ample cabinetry offers a great deal of storage space, making it easy to stock up during the winter! Huge counters ensure there’s also plenty of space for meal prep, and those who love to cook up elaborate feasts or whip up baked goods will certainly enjoy having the extra room to spread out in. 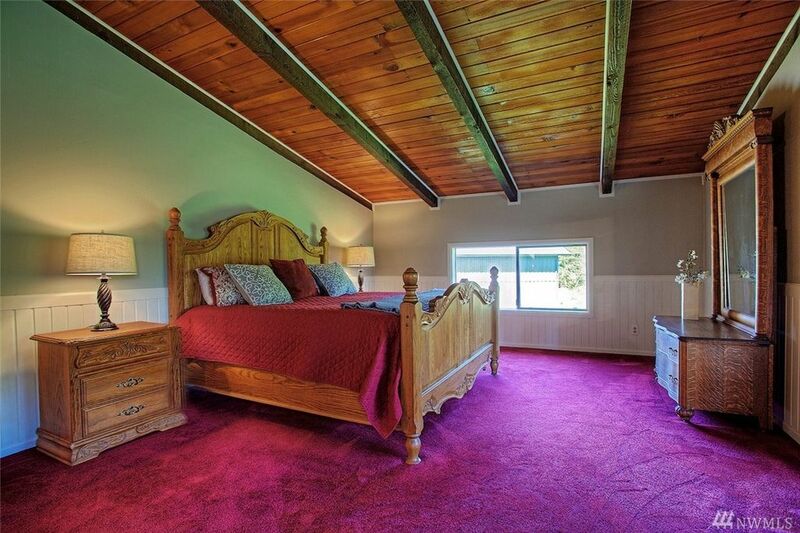 Retreat to the master suite, a bright and spacious haven conveniently located on the main level. 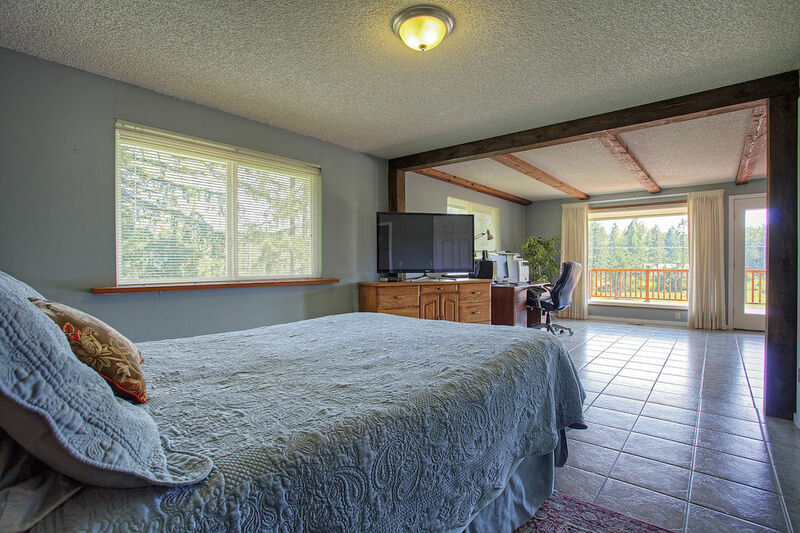 A sprawling layout provides plenty of room for an office or sitting area, and direct access to the backyard deck offers a wonderful way to wake up each morning—enjoy a cup of coffee as you breathe in the fresh air of the countryside in peace and quiet! Additionally, an ensuite bath offers convenience and privacy. Journey downstairs to find even more versatile space—2 bedrooms, a full bath, and a huge rec room with a wet bar and full bath await. Offering the ultimate hangout, this amazing area shows off the perfect spot to enjoy a movie or the game in. Invite a crowd to your next Super Bowl party—there’s room for everyone! This dynamic property also offers a cottage-inspired ADU. This charming 1-bedroom, 1-bath unit features a new roof, and inside, discover cozy living. A wood-stove, incredible exposed beam accents, an open-concept kitchen and living area, and lovely outdoor views make this spot perfect for a guest suite or the ideal place for a loved one to live in! For those who love spending time outside and exploring the outdoors, Eatonville is a prime location! Here, opportunities for hiking, camping, fishing, boating, dirt biking, horseback riding, and much more are all within reach. At 31615 44th Ave E Eatonville, WA 98328, you’re conveniently just a 2-minute drive to Highway 7, making it easy to head north or south. For those who commute to Joint Base Lewis-McChord, this location is especially ideal—JBLM is just a 15-minute drive away. 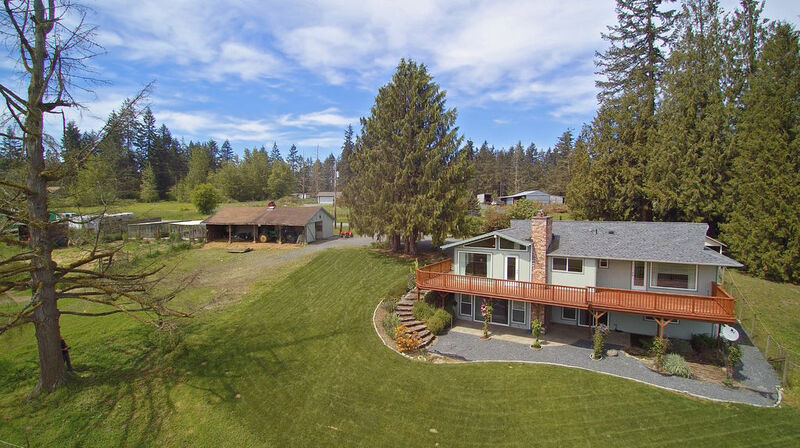 Paradise awaits on this impressive and secluded 12.23-acre property in Eatonville! 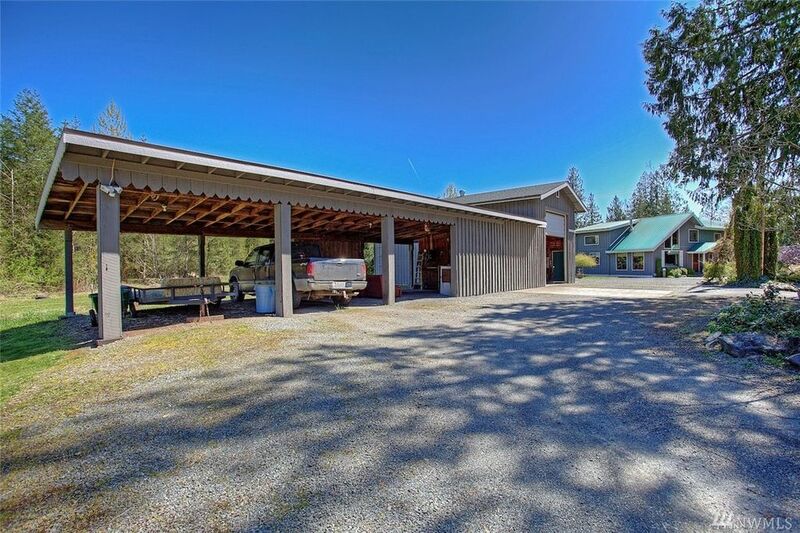 Discover country living and a tranquil setting that features a stunning 2,322-square-foot home, a 20’ x 40’ shop, a 60’ x 18’ equipment storage building, a chicken coop, garden, and so much more. This kind of opportunity only comes around once in a lifetime—this is the first time the home has been on the market in 39 years, and the owners have taken great pride and care in the home’s maintenance! 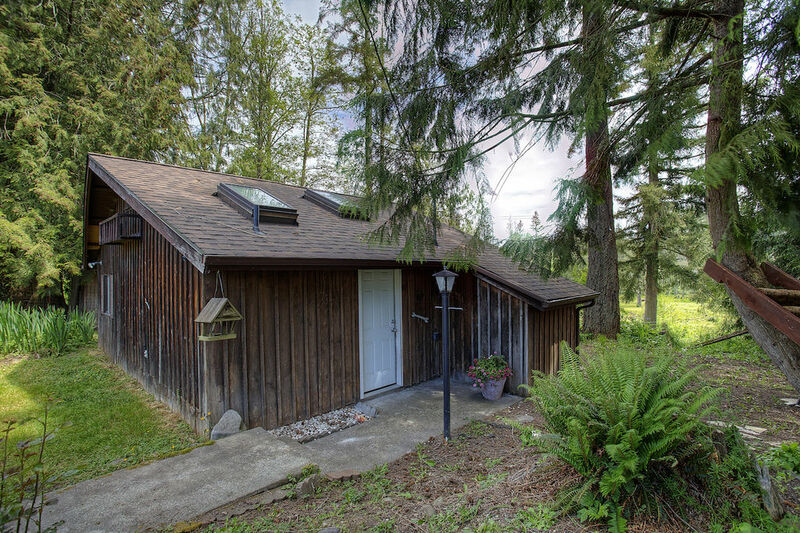 Located at 31707 Lebor Devore Rd E Eatonville, WA 98328, this timeless treasure is listed for $437,000. If you love spending time outside and taking advantage of the great outdoors, then this must-see property is truly a dream come true! Offering 12+/- fully fenced acres to enjoy, this expansive retreat shows off a long list of outdoor amenities. 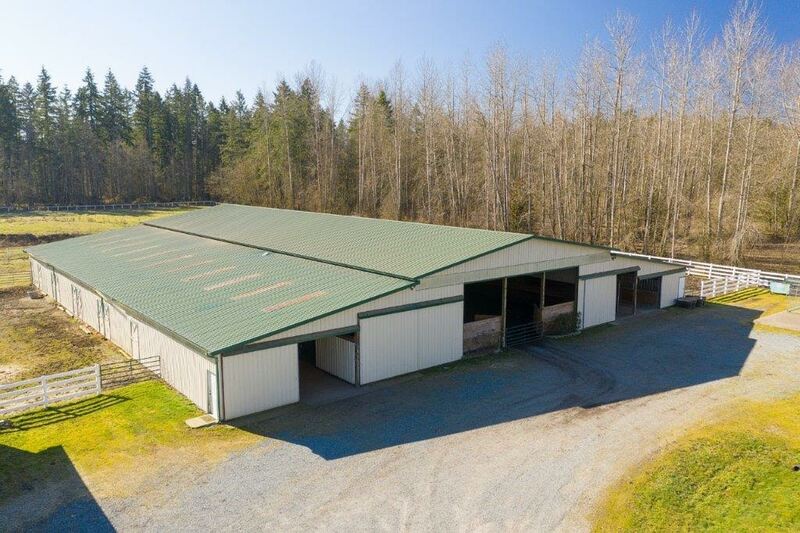 Discover a 20’ x 40’ shop, complete with a loft and an attached carport, plus a 60’ x 18’ equipment storage building with plenty of room for all of your outdoor tools and toys! A chicken coop gives you the opportunity to raise chickens and enjoy fresh eggs everyday, while a garden is ready to provide farm-to-table meals in the comfort of home! Stunning mature landscaping surrounds the home, while a deck and patio area are ready for entertaining. 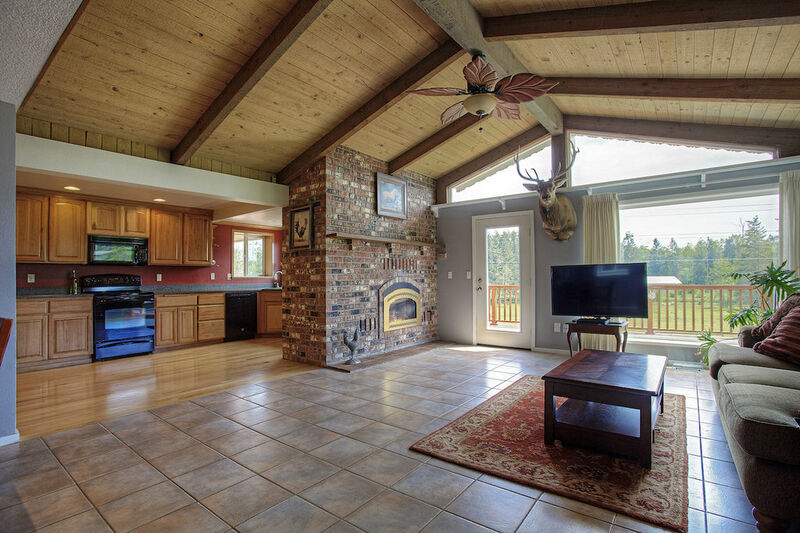 Summer get-togethers and weekend barbecues are definitely in your future here, and there’s a neverending supply of things for your guests to do and see on the property and surrounding area of Eatonville and beyond. 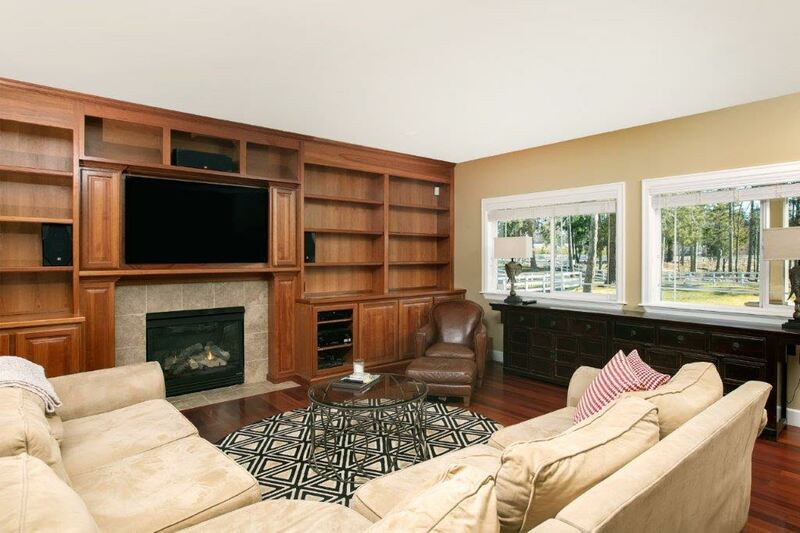 The interior of this spacious home is a treat to spend time in as well. Showing off lodge-inspired elements, in the inviting living room find eye-catching vaulted ceilings, a cozy fireplace, an exquisite staircase, and more. 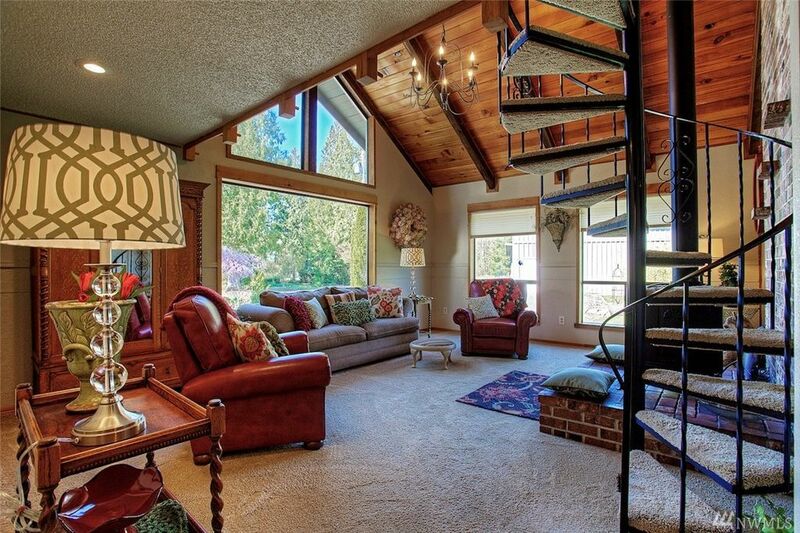 Huge windows bathe the space in cheerful sunlight while showing off the incredible view of the natural scene outside! This home’s open-concept kitchen and dining area offer easy living and convenience at every turn. In the kitchen, find ample storage and counter space for meal prep. The adjacent dining nook shows off a brick-accented fireplace and wood paneled walls for a cabin-inspired feel. Imagine whipping up weekend brunches with fresh eggs and ingredients from your garden and enjoying homemade meals in this welcoming haven! Find even more convenience in this home’s mudroom, complete with built-in cabinets. Journey upstairs to discover a versatile living area at the top of the stairs. Additionally, this home’s 3 bedrooms and 1.75 baths ensure everyone has their own private space, and the master suite is especially of note. This relaxing retreat is brimming with thoughtful details, closet space, and a 4-piece bath. Imagine ending the day on the deck relaxing in the hot tub while the sun goes down, and unwinding in this beautiful space that’s all yours! Located just 20 minutes from Joint Base Lewis-McChord, Eatonville is a popular choice for those who work at JBLM. Enjoy a country-inspired lifestyle that’s surrounded by opportunities for spending time outside and staying active. Northwest Trek is a short 12-minute drive from home, and several lakes offer opportunities for boating, kayaking, canoeing, fishing, and more!